East Boston, or better known as ‘Eastie’ is one of Boston’s largest and most diverse neighborhoods. Home to 40,000 residents, the neighborhood is made up of several connecting islands made of land fill. 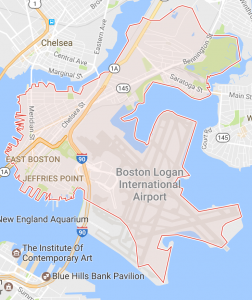 East Boston is also home to Logan International Airport and provides easy access to downtown Boston via the MBTA Blue Line. In recent years East Boston has become one of the more desirable locations for young professionals thanks to its proximity to downtown and beautiful views of the harbor. With such a dense area filled with residential homes, shops, schools and industrial areas, disposing of junk and old furniture and appliances is a much needed service for the growing neighborhood of East Boston. Contact a Junk Removal Company Serving East Boston Today! One Call Junk Haul proudly serves East Boston and Greater Boston area for residential & commercial junk removal services. With our exceptional customer service and affordable pricing, you can rest assured knowing you’re in good hands with One Call Junk Haul. We do what we say, when we say it at the agreed upon price and we even clean up after our selves. For your next junk removal, cleanouts, or furniture removal project, One Call is your premier junk hauling company for residents of East Boston. Give us a call at (978) 558-0037 or click the button below to book an appointment!